Apple pie is synonymous with America. Perhaps almost as much as the colors red, white, and blue or the national anthem. Bake it for the holiday season, for a birthday party, an evening get-together or simply because the family is craving it. Apple pie is the go-to dessert for the American family. Here are our favorite places to pick up a fresh apple pie in Wisconsin! The Crystal Cafe advertises its pies in its logo, “Pies 2 Die 4.” Visit the company’s website to read about Judy Bolier, owner, and her daughter, Jennifer Schustek, who bake the homemade pies. They use only pure and natural ingredients; no preservatives in their pies and no canned fruit. We all know apple pie is the pie of all pies but trying out a different flavor never does any harm. Batch Bakehouse features bourbon pecan, dark chocolate bourbon pecan, chocolate cream, fruit streusel, and Door County cherry lattice—all for affordable prices, ranging from $28 to $32 per pie. Most think of Wisconsin as the cheese state or the cranberry state, but Wisconsin also has a healthy apple industry. Stockholm showcases this industry with four different apple pie flavors. There’s the traditional apple with cinnamon, nutmeg, and sugar. Then there’s the apple crisp, the blackberry apple, and the caramel apple crunch. Maybe a flight of apple pies is in order? Come for the pie, stay for the decor. Broadway Diner is a 1954 fully restored vintage version of Silk City Diner, a previous version of what is now the Broadway Diner. Visit the little diner and check out the pastry case, fresh-made pies reside there. Call ahead to ask for daily flavors. From the house-made bakery, Market Street Diner offers both pie by the slice and pie by the slice a la mode. Even better—they offer both pick-up and delivery for pies and pastry items. Order a few pies for the holidays or maybe just pick up a slice for a late-night snack later on. At Hubbard Avenue Diner and Bakery they like to say, “known for great food, but famous for pie!” They feature numerous pie holidays on their website, complete with specials and deals for each one. 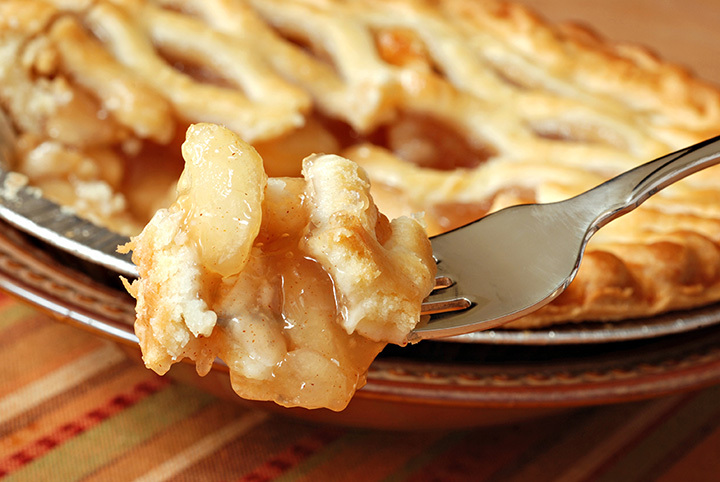 Check it out May 13—National Apple Pie Day. If you haven’t heard of Norske Nook pies, you aren’t a true pie fanatic. Famous for its Norwegian tastes, Norske Nook has won numerous awards for its pies. Look at any nearby Barnes & Noble bookstore and you’re sure to find the Norske Nook cookbook. It’s that good. With multiple locations throughout Wisconsin, Norske Nook pies are a dessert must-have. Humble’s website offers a list of available pie flavors as well as a pie guide. The guide specifies all of the available pies—traditional, petite, slab, pie bites, galettes, not for your toaster tarts, hand pies, and pinch pies. Pick and choose flavors with pie type and enjoy a dessert sure to rival grandma’s—and it’s even homemade. Read it and weep. On the Elegant Farmer’s website, it states they are the home of the award-winning Apple Pie Baked in a Paper Bag. Yes, you read that right—baked in a bag. The unique method creates a crunchy top crust with an old-fashioned bottom crust. Pies can ship frozen or fully baked.